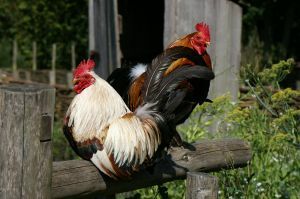 According to University of Ottawa flu virologist Earl Brown, lethal bird flu is entirely man-made, first evolving in commercially produced poultry in Italy in 1878. The highly pathogenic H5N1 is descended from a strain that first appeared in Scotland in 1959. People have been living with backyard flocks of poultry since the dawn of civilization. But it wasn't until poultry production became modernized and birds were raised in much larger numbers and concentrations that a virulent bird flu evolved. Somehow, the virus that arose in Scotland found its way to China, where, as H5N1, it has been raging for more than a decade. Industrial poultry-raising moved from the West to Asia in the last few decades and has begun to supplant backyard flocks there. Chinese researchers Qu Yuan, Qu Lai and Qu Shaozhong have come to a similar conclusion, but they go further. In recent history, China has experienced a human epidemic of keshan disease, which manifests as cough, difficult breathing, pulmonary edema, and eventually death by heart failure. There was some controversy over whether the disease was caused by Coxsackie virus - which normally is quite benign - or by a deficiency of selenium. It turned out that, when selenium was supplied, the disease practically vanished. The virus seems to have been an innocent bystander, rather than the cause. Yuan, Lai and Shaozhong point to this experience and to the fact that bird flu presents a very similar set of symptoms. They also explain that China has very low selenium content in much of its soil, and consequently in the feed that birds are raised with. They point out that factory-farm treatment of chickens further depletes the birds of this vital mineral, since eggs have a high selenium content. When chickens are made to lay eggs 24/7/365 by hormones and constant lighting, the selenium depletion becomes extreme, leaving them susceptible to what superficially appears to be an infection. Whether we should speak about infection or about a simple deficiency of a vital mineral is a question that must be resolved in time, but I shall let that rest for now - the whole edifice of viral causation of diseases might come crashing down. Pub Med lists 22 studies that show selenium has preventive and protective properties against a number of viral agents. Again, whether a virus becomes more virulent in the absence of selenium, or whether it is the primary mineral deficiency that does the damage which we then attribute to a virus is not the immediate question. Fact is, when selenium is given, the organism can more effectively cope with infections. Health authorities are groping for a pharmaceutical solution to what they say is an inevitable epidemic or even pandemic in the wings. Tamiflu is being stockpiled by governments the world over. The drug has been shown to be effective in increasing pharmaceutical revenues but to be rather useless in protecting people from avian flu. A vaccine for humans is not available yet and won't be until several months after the virus takes on a form that allows it to transfer between humans. A controversy has recently erupted over whether selenium could indeed protect people from the pandemic. Nutraingredients.com reports about it. It appears that the World Health Organization, the pharmaceutical industry and practically every last one of our national health authorities have no other preventive strategy in mind than stockpiling tamiflu and waiting for a vaccine. They are issuing dire warnings - "don't say we didn't tell you" - prepare to die! Research is largely done in secret, it is exclusively directed at the viral causation angle. Prevention is centered on quarantine, if needed with the help of the military, and on "killing the virus". 1. observing normal, basic hygiene rules (wash your hands, as your mother said). 2. get sufficient rest and avoid stress. If you do get stressed out, remember to get back into balance. 3. Eat well and regularly. Eat proper food that is nutritious. If you don't know what nutrients your body needs, find out! 4. Be sure to include selenium and vitamin C in your daily food intake. 5. Stock up on your preferred herbal anti-virals, colloidal silver and other protective goodies, just in case. 7. Oh yes, remember the birds! Start agitating for a change from factory farming practices to keeping chickens in a humane way. Biodynamic and biological agriculture is the trend of the future. 2/27/2006 - Following last week's claims and counter claims that dietary supplements may offer protection from avian flu, Stephen Daniells looks into statements that selenium supplements may offer protection. Many novel virus have been found in selenium deficient populations, with experts suggesting that relatively harmless viruses can mutate into deadly versions on passing through a selenium deficient host. Nutrient mixture containing vitamin C, Green tea extract (EGCG ), amino acids : lysine, proline, arginine, N acetyl cysteine , selenium, and other essential natural components can directly decrease viral multiplication in infected cells and limit their spread by curbing enzymatic degradation of extracellular surroundings. A potential bird flu pandemic poses a global threat.Since there is no vaccine available, there is an urgent need for effective, safe and affordable treatment of a bird flu pandemic. The most promising approach to immediately reach this goal is the use of micronutrients (vitamins, minerals, plant polyphenols). Their effectiveness to improve the immune function is already part of every textbook of biology. At our research institute, we tested a micronutrient composition for their effectiveness, specifically in blocking influenza infection. Vaccinating chickens may be the only way out of the bird flu nightmare in Asia. But it could also lead to the evolution of new strains, the latest research shows, increasing the risk of a human pandemic. Researchers at the U.S. National Institutes of Health will soon recruit 30 human volunteers to test the effectiveness of a vaccine containing a live but weakened form of the H5N1 bird flu virus. At least 29 nations have reported initial cases of avian influenza during the past seven weeks, reflecting the ineffectiveness of bird culling. Studies at USDA's Agricultural Research Service (ARS) in Columbia, Mo. indicate that viruses may affect insects that are short of selenium. The scientific community has known for some time that selenium is an essential micronutrient for people and animals. They've also just learned that insects also need selenium. "What we found is the insects that we tested needed selenium in order to resist viruses," said Kent Shelby, ARS research entomologist. ... average intake of selenium in the UK has fallen from 60 to 34 micrograms per day. The European recommended daily intake (RDI) is 65 micrograms ... geographical studies ... have shown a consistent trend for populations with low selenium intakes to have higher cancer mortality rates. And a study carried out in France ... which followed a group of 1,389 elderly volunteers to for a period of nine years, found that those with low selenium diets were considerably more likely to die from cancer than those with high selenium diets. China: Will Nano Selenium Help Prevent Avian Pandemic? Avian Flu - Is Specialization Killing Us? This article supports my hypothesis that acid rain, fertilizers etc are depleting the soils of selenium and driving pandemics of HIV/AIDS, Hepatitis B and C, Coxsackie B and numerous other viral infections. As we destroy the planet, it destroys us. Follow the link to Harald Foster's site. You will find a free book to download titled "What Really Causes Aids". The book discusses a very similar view (severe selenium deficiency and need for certain nutrients) in AIDS. The highlights of this article happen to coincide with the AIDS story. In both cases, there is the controversy whether "a virus is the probable cause of AIDS" (that only appeared in the Gallo isolate) or a nutritional disorder that is treatable with a coctail of antioxidants, including selenium. Researchers have reported that symptoms of AIDS dissappear with selenium supplementation and improved nutrition. The controversy over whether the disease was caused by Coxsackie virus - which normally is quite benign - or by a deficiency of selenium follows the very same arguments but the arguments of selenium depletion and selenium deficiency are clearly in favor of the causative factor with the virus standing as an innocent bystander. So, avian flu is nothing more than an "opportunistic infection" in the event of selenium depletion and selenium deficiency. It turned out that, when selenium was supplied, the disease practically vanished. The virus seems to have been an innocent bystander, rather than the cause (refer article). And, Stephan Lanka, a German virologist, who believes that a virus is not the cause of bird flu. This article makes a very useful point - it points out that factory-farm treatment of chickens further depletes the birds of this vital mineral, since eggs have a high selenium content. When chickens are made to lay eggs 24/7/365 by hormones and constant lighting, the selenium depletion becomes extreme, leaving them susceptible to what superficially appears to be an infection. I have written on the role of selenium in reversing disease conditions and Pub Med lists 22 studies that show selenium has preventive and protective properties against a number of viral agents. Selenium is by itself an antioxidant but more importantly it is critically improtant for producing the natural (selenium -based) antioxidant enzymes that are important in mitochondrial function and in producing biochemical energy for aerobic cellular respiration. There is one other special role of selenium in health and disease, especially viral infections. Selenium is very important as an element that readily provides electrons to the electron transport system for the production of repair proteins and antibodies. considering this information as a whole, the truth very well lies in the fact that birds with selenium depletion are susceptible to avian flu. We need to rethink our "factory-farms" and animal feed formulas and this article is very timely and enlightening as it also has a bearing on "Rethinking AIDS". I only hope the regulatory authorities read it and make some intelligent changes to see if those changes improve the situation but bureaucratic fat is something that does not melt easily and the only way to treat it is by revamps in the system rather than shape-ups.